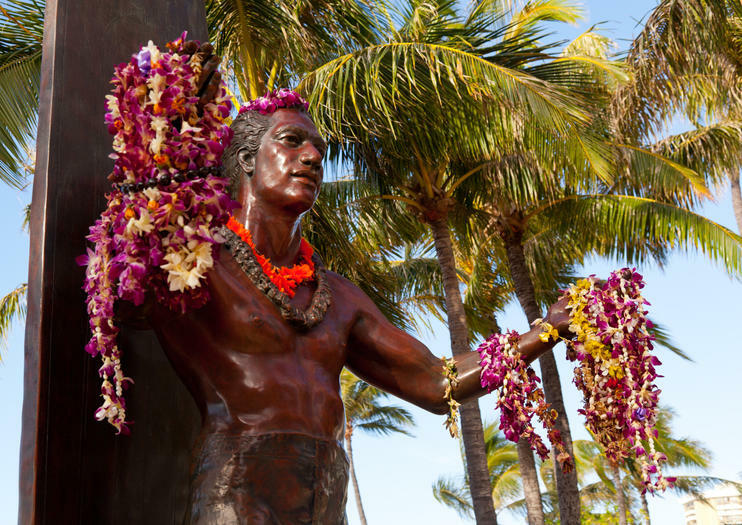 A landmark stop on almost every organized Honolulu tour is the nine-foot-tall bronze statue immortalizing Hawaii’s original ambassador of aloha, Duke Paoa Kahanamoku. One of those guys who was seemingly good at everything, Kahanamoku wore many hats. He was a Hollywood actor, a full-blooded Hawaiian descended from alii (the royal class), an Olympic swimmer who won gold in both the 1912 and 1920 games, an Olympic water polo player, a 13-term sheriff of Honolulu and one of Waikiki’s first surf and canoe instructors. Kahanamoku used his charm and personable nature to popularize surfing and was later the first person to be inducted into both the Surfing and Swimming Halls of Fame. Poised in front of a longboard and welcoming visitors with open arms, the Duke statue has enjoyed a prime seaside spot across from popular Waikiki breaks since it was installed on what would have been Duke’s 100th birthday in 1990. Many visitors honor Duke’s memory by draping floral and kukui nut lei around his neck and from his arms, or just pause long enough to take a shaka selfie. Making this stop even more popular is the fact that one of Honolulu’s live city cameras is constantly trained on the statue and the palm-lined sands of Waikiki behind it — a great tool for making family back home jealous in real time. Each summer, Duke’s OceanFest honors the waterman’s memory with ceremonies at the statue and a series of ocean sporting events including longboard surfing, paddleboard racing, swimming, surf polo and beach volleyball. The Statue of Duke Kahanamoku fronts Kuhio Beach between Kaiulani and Uluniu avenues off Kalakaua Street, Waikiki’s main drag. The Duke Kahanamoku statue live cam can be viewed online from anywhere in the world. Discover Honolulu, Pearl Harbor and/or Waikiki on a 1-, 4- or 7-day hop-on hop-off tour and see all the top attractions at your own pace. Step aboard a double-decker bus or open-air trolley to pass the capital city’s best restaurants and shops, historic sites and renowned scenery. Choose from four different routes, marveling at Diamond Head on the Green Line or the beautiful Makapuʻu Point on the Blue Line. Upgrade to include all of the lines in your ticket. Circle the island of Oahu on this 8-hour private tour for a maximum of 5 passengers. Discover the turquoise waves, famous for surfing and the soft sand beaches, as well as more than 30 other popular attractions. Get personalized attention from your guide as you visit attractions such as the Dole Pineapple fields, historic Haleiwa town and various locations made famous by feature films. Snacks, bottled water and round-trip transportation from Waikiki hotels are included (a surcharge for pickup more than 5 miles from Waikiki (Westside - e.g. Ko'olina, or North Shore Oahu $100). Get a comprehensive overview of Oahu's landmarks and highlights on this 6-hour small-group circle tour. Enjoy a small-group setting to ensure personal attention from your local guide while seeing over thirty local attractions. See the surf and sand at Waikiki Beach, taste some samples of Dole Pineapples learn about the history of Haleiwa town. Get the insider info about favorite local eateries and see filming locations for various movies and television shows. Round-trip transportation from Honolulu hotels is included. Glide through Honolulu’s scenic highlights and historic landmarks on a 1.5-hour Segway tour of Oahu’s most iconic city. Learn to maneuver your gyroscopic ride, then follow your guide through the lush Kapiolani Park, where swaying palms frame unforgettable views of Diamond Head. Explore the stunning shoreline on coastal paths to Makalei Beach Park and Queen’s Surf Beach, snag a selfie with Duke Kahanamoku’s famous statue, then finish your tour in the heart of Waikiki. Explore secret spots and local beaches around Waikiki during a 2-hour guided tour that includes ocean views from Diamond Head. Hear interesting facts about Hawaiian history and Oahu culture, with stops at the Hawaii Film Studio, Kapiolani Park, Ala Moana Beach and more. You’ll get a feel for what it’s like to live, eat and shop like a local. Numbers are limited to 11 people to ensure a small-group experience. Explore Diamond Head and the Waikiki area on this 2-hour guided Segway tour. Climb on to your own Segway Personal Transporter, a self-balancing, two-wheeled electric scooter that allows you to enjoy some of the Honolulu area's most important sites without all of the walking. Visit Diamond Head Lighthouse, Waikiki Beach, Kapiolani Park and the bustling streets of the Waikiki area. Listen as your guide provides engaging, informative commentary about the culture and history of the area.